The phased.ShortDipoleAntennaElement object models a short-dipole antenna element. A short-dipole antenna is a center-fed wire whose length is much shorter than one wavelength. 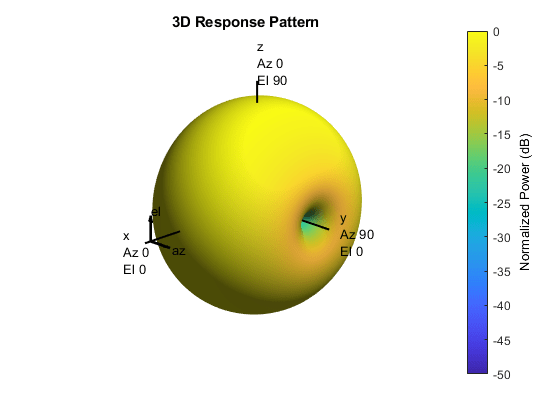 This antenna object only supports polarized fields. Define and set up your short-dipole antenna element. See Construction . Call step to compute the antenna response according to the properties of phased.ShortDipoleAntennaElement. The behavior of step is specific to each object in the toolbox. h = phased.ShortDipoleAntennaElement creates the system object, h, to model a short-dipole antenna element. h = phased.ShortDipoleAntennaElement(Name,Value) creates the system object, h, with each specified property Name set to the specified Value. You can specify additional name-value pair arguments in any order as (Name1,Value1,...,NameN,ValueN). Antenna operating frequency range specified as a 1-by-2 row vector in the form of [LowerBound HigherBound]. This vector defines the frequency range over which the antenna has a response. The antenna element has zero response outside this specified frequency range. Dipole axis direction, specified as one of 'X', 'Y', 'Z', or 'Custom'. The dipole axis defines the direction of the dipole current with respect to the local coordinate system. 'X' specifies a dipole along the x-axis, 'Y' specifies a dipole along the y-axis, and 'Z' specifies a dipole along the z-axis. An x-axis or y-axis direction is equivalent to a horizontal dipole and a z-axis direction is equivalent to a vertical dipole. When you set the AxisDirection property to 'Custom', you can specify the dipole axis using the CustomAxisDirection property. Custom axis direction of the dipole antenna, specified as a real-valued 3-element column vector. Each entry in the vector represents the component of the dipole axis along the x, y, and z axes in the local coordinate system. To enable this property, set the AxisDirection property to 'Custom'. Specify a short-dipole antenna with the dipole oriented along the y-axis and operating at 250 MHz. 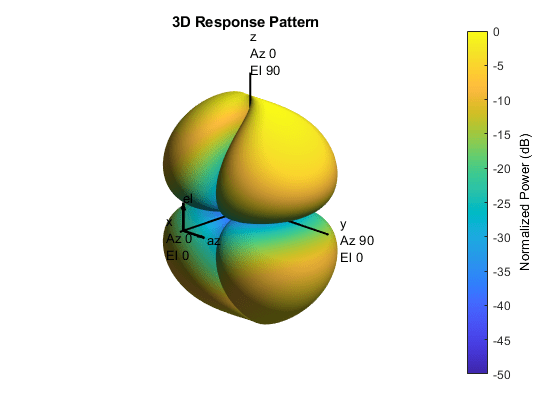 Then, plot the 3-D responses for both the horizontal and vertical polarizations. 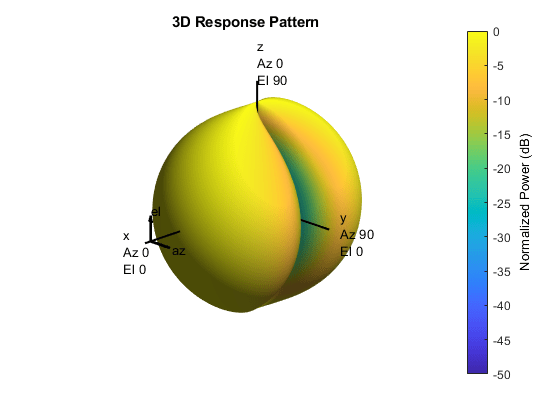 Plot the horizontal polarization response. Plot the vertical polarization response. Specify a short-dipole antenna with the dipole oriented along a custom axis and operating at 250 MHz. 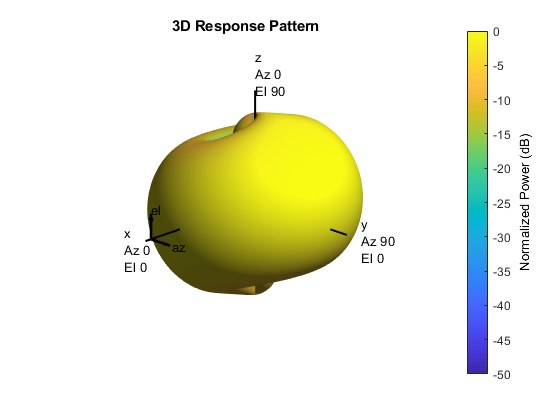 Then, plot the 3-D responses for both the horizontal and vertical polarizations. Create the short-dipole antenna element System object™. An easy way to create a custom axis is to rotate a unit vector using rotation functions. The total response of a short-dipole antenna element is a combination of its frequency response and spatial response. This System object calculates both responses using nearest neighbor interpolation and then multiplies the responses to form the total response.